To help organizations apply consistent branding (colors and logos) to their information products, ArcGIS Online administrators can now deploy a shared theme for configurable apps and ArcGIS Open Data sites created by members of their organization. Authors of Esri Story Map Journal, Story Map Series, and Story Map Shortlist (in beta) apps can let readers find addresses, places, and features by implementing a search bar. Story Map Cascade, which has enhanced image galleries and 3D performance, is also available in all supported languages. The Time Aware configurable app template, which allows users to visualize time-enabled layers with a time slider, now supports including future dates in sets (for live weather forecasts, for example). As part of Esri’s effort to design web products that align with Web Content Accessibility Guidelines 2.0, users can also interact with the time slider via the keyboard. With Crowdsource Reporter—used to collect citizen information on issues and events—users can reorder the details, attachments, and location sections of the submission form. They can also load the app onto mobile devices and see a map view of existing reports instead of a list view. The update to GeoPlanner for ArcGIS enables users to visualize data in 3D so they can better evaluate specific scenarios. This 3D mode allows users to publish features, model shadows, view perspectives by date and time, and evaluate a scenario’s potential impact by looking at key performance indicators. Esri’s Apps for the Field and Apps for the Office continue to become more powerful as well. For Android users, Collector for ArcGIS is now better integrated with Navigator for ArcGIS and Workforce for ArcGIS. Fieldworkers with Android devices can use Workforce for ArcGIS on their mobile phones and tablets as well. And Workforce dispatchers can disable clustering, identify workers more easily, and see which crew members are closest to a particular assignment. Users who have multiple accounts for ArcGIS Online and Esri websites can now link them and switch between accounts, connecting all their Esri customer information—from My Esri, e-Learning courses, and GeoNet, for example. The option to switch accounts is currently available from an organization’s ArcGIS website, the ArcGIS Online website (for public accounts), and Esri websites. 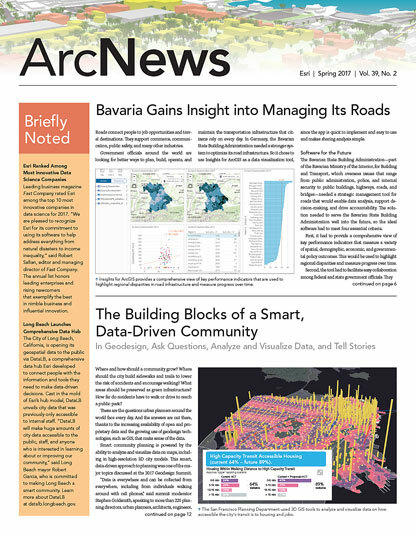 To learn more about the March updates to ArcGIS Online, visit the ArcGIS Online What’s New page and check out the ArcGIS Online blog.